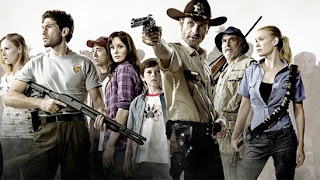 After the success of the first season of 'The Walking Dead', including a renewal after only one episode (the feature length pilot) had aired, anticipation for the second season has been high, but events behind the scenes have been as much a topic of discussion in the press as the show itself. The show returns to US and UK screens in October, but will it be the same show we enjoyed for six short weeks last autumn? From the trailer we can see that there are still guns and zombies, as well as the usual atmospheric soundtrack, but the survivors are moving out of Atlanta and seemingly splitting up into smaller groups. Like the characters, the thirteen episodes of the second season will also be split into groups, 7 airing in October and November, the other 6 airing from February, with the first episode again being 90 minutes long. The biggest change for this season of 'The Walking Dead' is the sacking of creator and showrunner Frank Darabont and the promotion of his replacement Glen Mazzarra, who was previously hired as Darabont’s number two. The show’s creator was fired by AMC because of disagreement about the reduced budget he would receive in the second season, a result of the channel’s costly negotiations with the producers of 'Mad Men' and 'Breaking Bad', their other hit shows. Despite his departure, the show is still likely to have Darabont’s creative fingerprints all over it, his departure coming as late as the filming of the fifth episode, with the first seven episodes written, so it is unlikely we will get to see the Mazzarra’s concept of the show fully develop until the second batch of episodes airs. Despite the changes behind the scene and the reduced budget the second season of 'The Walking Dead' is still likely to be a hit, and even if it maybe looses a few of its flashes of brilliance, it is hard to see it not continuing to be a gory, entertaining 13 episodes. 'The Walking Dead' Season Two premieres on AMC in the US on October 16th, and on October 21st in the UK.